Brigitte Eckert has contributed a section from her translation of Bettina Schinas' letters from Greece in 1834-1835. Bettina was the daughter of Friedrich Carl von Savigny (1779-1861), prof. of Roman Law at the Berlin University and one of the developers of the new (Humboldt) university, and Gunda Brentano, from the Brentano family. She married one of her father's students, Konstantinos Schinas, who later became, among other things, the first director of the Athens university. 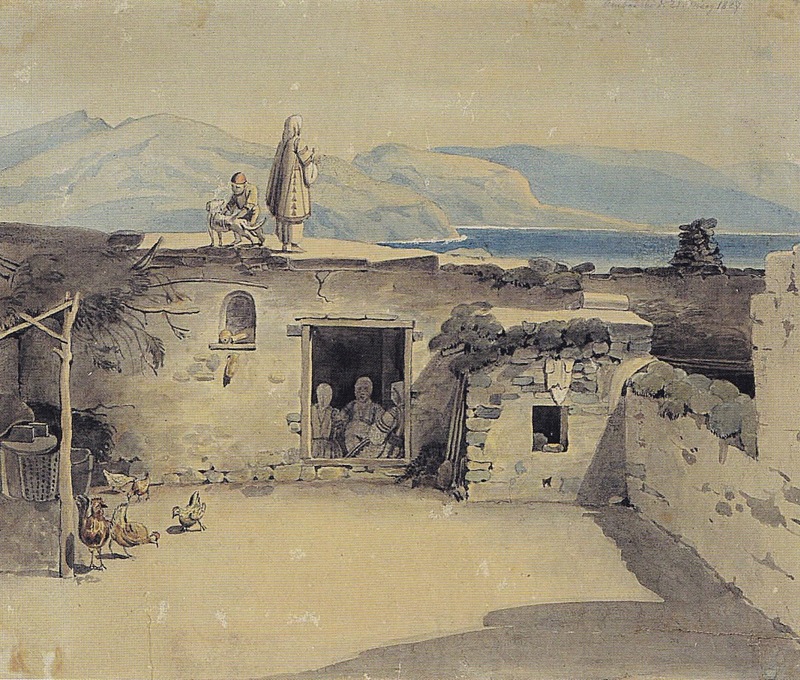 Bettina went with her husband to Nauplion in 1834, where they lived in a house at Ag. 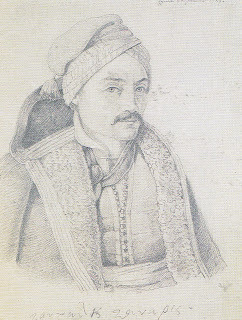 Giorgios, and then moved with the government to Athens in 1835. She wrote almost daily letters to her family, telling about the mud, the cost of food, the problems of finding medical care, poor mad Staikopoulos in Palamidi, the stress every evening of having to get in or out of the city before the gates were closed. From Athens, she wrote about the difficulties in finding adequate housing, the smell of the dead in the ruins, the gossip at Otto's courts, and much much more. 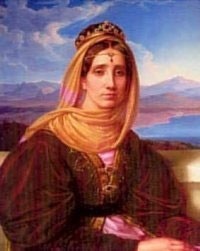 Bettina Schinas arrived in Nauplion on 9 October 1834. She died in Athens on 24 August 1835. Her Schinas letters were published in Germany, edited by Ruth Steffen. Brigitte Ekert is preparing an English translation from the manuscripts which are kept in Muenster. Future entries here will have more contributions from Brigitte and Bettina. To her parents, May 7-18, 1835. Athens. At 5 in the morning with S. [her husband] to Greiner, where the party gathered, having coffee there. She, Prokesch, is going to give birth soon so she doesn’t ride anymore, he, Greiner, went with her in the coach and me. On the box, young Mr. Beeg, a guitar at his neck. On horseback the daughter Greiner, the two oldest Armannspergs, Prokesch, S. and 8-10 young gentlemen. The weather was heavenly, everywhere people who were enjoying walks on the feast day of May 1st. After half an hour we were at Ampelokipia, a place with many olive- and other trees, water and even laid-out gardens. Katakasi has bought there, building now a little garden house, next year a summer house. We rode on 1-2 hours, though finding no path, and got out two times. Finally we reached Kephisia at about 10. We had a long walk and breafast at 1, walked again from 2 to half past 3, were back in Athens at 5. At 6 we all had lunch at Prokesch’s. At half past 8 S. and I and the two Armannspergs went home in Prokesch’s coach. The excursion successful as possible, everyone was cheerful, the weather splendid not too hot nor too cold. The village of Kephisia lies on a low hill in the middle of olive-trees which spread further along the sides. In between single poplars, big mulberry trees high up climbed by grapevines, figs, vines, gardens (not our kind, but vegetables, some flowers, grass with wild flowers, trees, vines.). The houses are ruins to a great extent. A big beautifully-vaulted mosque serves as stable to 4 cows, but without doors. We mounted the minaret by the steps outside. The view is celestial; one sees the gulf, the mountains around and the islands grouping splendidly. In front of the mosque is a small grass plot surrounded by a wall, a wide marble staircase leads down to a rather big place entirely shadowed by one of the biggest and most beautiful mulberry-trees I ever saw and a huge plane-tree which has a little square wall around its stem as a seat. At a corner of the place crystal water flows out of two little pipes, at Turkish times probably not as thin as a little thread. Where ever one walks are springs, wells, flowing waters. At first we went through marsh, gardens, crossing creeks etc., where you would turn being conscious there’s no getting on; several times between two walls enclosing gardens with clear water flowing out of Turkish wells, watering the place as a brook as the old drain does not exist anymore, until it finds some way out. In these brooks we walked on top of prominent stones, led by the gentlemen who stepped into the water, sometimes waiting until they put stones or shrubs where we could not have gone further. I myself, in rubber boots, was waterproof. We reached the well of nymphs, a square walled low place, the wall 3 feet built of marble slabs, open at the side where the water streams out as a creek of 2-3 feet and about the same depth. I don’t remember I ever saw a water so clear, the room was about 9 feet deep and each very little stone at the ground was surrounded all the way down by a colourful rainbow, which was refracted and multiplied amazingly often by circles in the water produced by swimming beetles; beautiful flowers grow at the borders of the creek and bend over it, on them innumerable golden beetles and dragon-flies of manifold colours, the ground was covered by tendrils. All shadowed by olive-trees. Only the well with its marble wall in front of the trees in full sun. We were there at about 12 without suffering the heat at all. Ruins of columns were liing about. The people still believe in the existence of Nereids. A woman had told one of the gentlemen who were with us: I had a daughter but the Nereids took her away. When she was 13 years old she went once to the mountains where many springs are and stayed away several days, came back, but sad and didn’t retrieve her peace of mind, again and again she had to go to the springs, we urged her, it didn’t help, her yearning was violent, it gnawed her until she finally died. All this happened because she had seen the Nereids. . .
An old water pipe crosses the main street on a wall 12-15 feet high, you pass it through a vaulted door opening. On the other side the path which leads to the mosque and plane-tree follows a long way this wall. I don’t know if the door has been surrounded by stalactites on purpose or if it was built by the waters, I think the latter because they happen to be at several places. The door is thick with jagged stalactites, on top of it grow little trees like the red acacia, covered by blossoms, ivy from an old stem twines around and grows through the wall which produces little fig-trees at some places. The bank of the brook is grown over with the most lovely flowers and the wall with flowers of all colours . . .
After breakfast we walked around the village through a shallow valley to a little hill on the other side. We sat in the shadow of an evergreen oak-tree which is now full of young leaves. On top of the highest branch sat a black headed golden-yellow bird which seemed to be pleased by the company because it was looking down and started to sing most lovely again and again. In front of us the shallow valley with it’s beautiful vegetation covering the hill of Kephisia around the houses, the village sitting prominently in the green, backwards we saw in the distance the mountains behind Argos; in the foreground the cut in the mountains where the way to Eleusis runs; on the left above the olive-trees near and distant mountains; on the right the sea, Salamis, Aigina etc., this all felt like a dream to me. I wish I could have enjoyed it with you. It was a Monday. John VIII embarked on a Venetian galley from the Kynegos shore close to the Blachernae palace. The Patriarch, Joseph, had embarked the day before from the main harbor, the Eugeniou, and sailed up to wait for the Emperor. The Venetians had provided three galleys. John's brother, Demetrios, had the third. All three galleys were crowded with delegates to the Council, servants, hangers-on, and people wanting a free trip to Italy, not to mention the extra ropes and oars, and the cages of animals on deck for food. Ordinarily, none of these people would have dreamed of sailing the Aegean in winter, but accumulated pressures, including a general shortage of funds and the expense of the chartered galleys, made it necessary for them to leave. One should bear in mind that the Patriarch was quite elderly and had heart trouble, and that John suffered a great deal from gout and various psychosomatic ailments. Neither would have been a good sailing companion at the best of times. Neither wanted to go on this trip and neither expected any good out of the results. Many were grieving, but it was a last desperate attempt to get aid for the tiny empire. As soon as they were all on board, there was an earthquake. This was taken as a bad omen, but the trumpets sounded, the people on shore shouted "Cronia polla!" and the ships sailed around the horn. Then they anchored for a couple of days, so the 600 or so passengers could get accustomed to the crowding and the spaces of galleys designed for freight and not for passengers. It was not until the 27th that the ships, accompanied by another galley belonging to John, three freight galleys, and a Florentine ship, actually left Constantinople. There was a calm and the oarsmen made little progress. That night there was a storm "and darkness became tangible." They were afraid of shipwreck on one of the Marmara islands, but when daylight came, they saw they had been blown past the islands. When they reached Gallipoli, the Turks shot arrows at the ships and hurled stones with a catapult. Stopping just beyond, at Madytos on the right-hand shore, there was another earthquake. The Patriarch sent word to the Emperor that he wanted off, but John told him to wait. Then while the sailors were off refilling the water jars, they were attacked by a band of Turks. The sailors dropped their jars and ran back to the ship. John sent an emissary to the local subassi and asked permission to get water, which was granted. They spent the night anchored there, or tried to, except that Turkish troops encircled the small harbor, lit fires, and ululated all night. Then when they tried to sail, the Turks refused to let the Patriarch's galley release the mooring ropes. The sailors had started chopping at the ropes with axes, before they were finally allowed to sail. It took a week to sail from Lemnos to Negroponte, which they reached on Saturday morning, 7 December. Venetian officials welcomed them warmly and invited them in to rest. The Patriarch was anxious to get off the ship and into a real bed, but John said it was unsuitable. So he had a tent pitched on the shore and rested there for two days, while the island residents brought him gifts of fruit, wine, and food. John stayed on his galley. The ships set sail for the Morea on Monday, helped by good winds. On the second day, the winds turned violent, the ships became separated, and the Patriarch's ship ended up at Sykea, on the coast of Lakonia. After two more days, when the Emperor's ship failed to appear, they sent a boat up to Kenchreai, at the Isthmus, to see if there were any information. There was: the Emperor's ship had stopped at Gaidouronessos -- Donkey's Island, near Piraeus, to wait out the storm, and then gone to Kenchreai. But Donkey's Island could not be taken for granted, either. There were two Catalan boats and two other boats also waiting out the storm on the island. The Catalans, discovering what was being delivered into their hands, decided to capture the Emperor, but cooler heads prevailed and this was thought unwise. Nearly a year and a half later, in Florence, a man from Rhodes who had been a prisoner of the Catalans and escaped, showed up and told the Emperor's attendants what had nearly happened. When the galleys docked at Methone, Venetian officials, and the Latin and Greek church officials all came out to greet them. 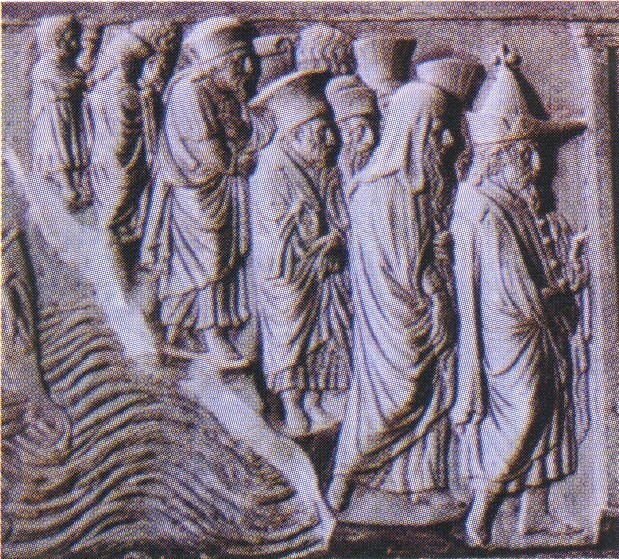 The Latins wanted to bring the Patriarch into the city in procession, holding him on either side according to their custom. The Patriarch was upset at having to process with Latins, but several of the court officials told him it would be simpler to go along with it. 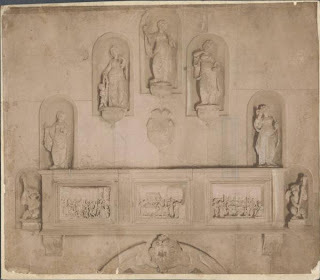 He was led by the Bishops of Corone and Portugal [I have no idea at all what the Bishop of Portugal was doing there], the Greek clergy carried their icons, and it was all very fine until they processed the Patriarch to a very old house which belonged to the Latin church. Pigs lived on the ground floor. There was a bed for the Patriarch upstairs, with a filthy pillow. He was given an inedible meal. It was the pigs grunting during the night that particularly disturbed him. The Bishop of Corone went to the house of the Venetian governor -- Giovanni Cornaro -- and asked him to invited the Patriarch there. Cornaro did, and the Patriarch stayed for 13 days. They celebrated Christmas together, and things went fairly well. The question of leaving became an issue. Quite a few people were refusing to go further because of the crowding and discomfort on the ships. There were suggestions of hiring another ship from Nauplion, and objections about the delay that would cause. Then someone suggested that the galleys off-load the slaves they were carrying -- this is the first we have heard of the slaves -- which would give more room. After slaves were loaded onto another boat for Venice,, plague broke out among them: all died and were buried at sea. None of the Greeks or Latins was affected. They galleys sailed from Methone up to Navarino-Pylos to meet John and Demetrios who arrived with a large suite of people from Mistra, including Plethon, Scholarios, and Bessarion. This made for nearly 700 Greeks [at papal and Venetian expense] in the three galleys. They set sail, and then the sails on two of the galleys ripped. By the eve of Theophany -- 5 January -- they had reached Kefphalonia and stopped in at the harbor of Pitzkardo. There was much protest at this, because the winds were so perfect for sailing, but with the exception of one galley that went on to Corfu they all stayed. That was when the bora started blowing, five days and nights, with such intensity that they were not even able to get out to fill the water jugs. At the first opportunity, they set out again, and sailed into another storm. The rigging that supported the yardarm tore, it was swinging back and forth, they were sailing in total darkness in winds and waves so hard that most of the sailors could not walk on the deck. Then the wind swung around and the waves were stronger. They were pushed back to Pitzkardo where they anchored for three days while the storm continued. Everyone on the ship was flat out, exhausted and sick. They were finally able to start out again on a night with a clear moon. The Patriarch's galley had not cleared the harbor before a gust of wind drove another boat into its side, shattering the oars like reeds. But they managed to get to Corfu the next day where they stayed for eleven days. In the gulf of Ragusa there was another storm that scattered the ships, but they all managed to regroup at Corsola. Here the Emperor and the Patriarch disembarked and had a private conversation, as they had not seen each other since they left Constantinople two months earlier. They sailed for two days, then the Emperor was so ill that they had to stop at a deserted island. It snowed. The Emperor was carried ashore to a tent, and nearly everyone was freezing. They sailed to Zara where they rested for three days. Setting out again, they ran into another storm and the yardarm snapped. They repaired the yardarm at Ruvini. When they got to Parenzo a storm kept them in port for three days. The rest of the way to Venice was fine, but that was only a day's sail. A later post will report the winter trip back to Constantinople, two years later. Both images are of panels from the doors of St. Peter's in Rome made by Filarete. Notice the double-headed eagle. with inhabitants, but in the most wretched condition." In August 1828, Col. Jonathan P. Miller of Vermont published a book with the title The Condition of Greece in 1827 and 1828; Being an Exposition of the Poverty, Distress, and Misery to Which the Inhabitants Have Been Reduced by the Destruction of Their Towns and Villages, and the Ravages of their Country by a Merciless Turkish Foe. Miller had been what he called "an unruly dissipated youth." After a religious conversion while in the army, he left and went to the University of Vermont to study Greek classics. Coincidentally with the college buildings burning down and destroying his books, he learned of the death of Byron. 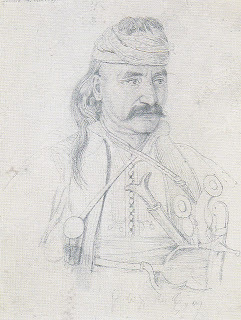 He volunteered to fight for Greek independence, with the backing of the Boston Greek Committee, and arrived at Missolonghi in November 1824, the first American Philhellene. He learned Greek quickly, and acquired a reputation as the "Yankee Dare-devil," fighting Ibrahim Pasha at the Battle of the Mills near Nauplion in June 1825. After the fall of Missolonghi in 1826, he returned to the States where he actively campaigned for Greek independence, lecturing and raising funds for civilian relief. In 1827, he was sent by the Greek Committee to take a relief ship to Greece, one of 8 the States sent in 1827 and 1828. Seventeen more embarked from Ancona in 1826 and 1827, sent by a Swiss banker, Eynard, and the Paris Greek Committee. Miller's book reports the donations for which he was responsible. The donations of cash amounted to $36,209.30, the largest individual donations being for $100. Many donations were in change, many were for 1, 3, or 5 dollars. It is impossible to calculate a modern equivalent. Miller's donors include: John J. Astor, A Friend, A Friend to religion and humanity and a friend to the Greeks, A Lady, several identified as A Gentleman,A Mechanic's weeks work ($5), A Soldier of the American Revolution, and someone from a previous relief ship giving back the remains of his expense money. Collections came from churches, schools and other institutions, including the NY High School, Eighth Presbyterian Church, German Reformed Church Christie Street, Pupils in a Select Male School, Proceeds of a Ball at the Park Theatre, Master Stone Cutters' Society, New York Typographical Society, and West Point Cadets. The Greek Committee's letter of instructions said, more than once: "You are aware that this cargo is the result of contributions made by benevolent individuals and associations . . . to the sole object of feeding and clothing the necessitous inhabitants of Greece. . . . these are not designed to supply the garrisons . . . but are intended for the relief of the women, children, and old men, non-combatants of Greece." Miller and his ship Chancellor arrived at Nauplion on the night of 23 May, and in the morning, discovered with delight that the US frigate Constitution was in the bay. [This lovely ship still sails, and can be visited in Boston harbor.] 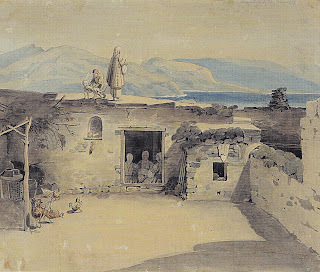 After unloading some 160 barrels of bread and flour at Myloi, 60 for the Greeks in the hills, and 100 for the women and children who had escaped Missolonghi, Miller received a letter signed by Makryannis and several others ordering him to come to Poros to the current seat of the Greek government. He left a large selection of supplies in Nauplion with Samuel Gridley Howe [much more about Howe in another entry] to distribute there. Miller went to Poros, met with members of the government, and was warmly welcomed. He set about discharging his cargo, which was not easy, as there were no wharves, and everything had to be off-loaded onto small boats and rowed in from the Chancellor out in the bay. 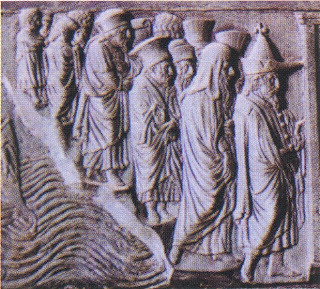 Makryannis immediately introduced Miller to families in need of help to whom he gave barrels of flour and pieces of cloth. In contrast, Howe wrote to Miller that Kolokotronis and Grivas had tried to seize the supplies in Nauplion for their soldiers. It took the authority of the Captain of the Constitution to force them to return the keys of the storehouse to Howe. Gave cloth to six girls and four small boys, sufficient to make them all suits of clothes. Gave also to six women, a pair of shoes to each. Commenced delivering out the flour to the poor widows and orphans at Poros, collected from various places. To those of Poros I gave seven barrels of flour, which were divided equally among ninety-seven souls: to the others I delivered one hundred and twenty barrels of flour, to be divided among one thousand eight hundred and two souls. Sent the half barrel to Spetzia for the suffering family of eleven individuals. Also delivered about one thousand yards of cotton and woolen cloth to the naked. In the evening I took a long walk on the Peloponnesian side of the Island. . . . I found a family under a tree, the mother of which was sick of a fever, with four children around her. Having nothing else with me, I gave the mother two dollars, at the same time telling here that it was a donation from the ladies in America. The poor creature was overwhelmed with joy. She called upon God to bless the souls of those who had so liberally supplied her wants. Gave to the refugees from Thebes and Athens fifty-five garments, out of the box sent from New Haven, in Connecticut; also six pair of shoes. In the evening I saw upon the Platine [plateia] a man whom I thought I knew, though he was disguised in a Hydraote dress. It proved to be one Allen, from Kentucky, a man whom I am ashamed to acknowledge as a countryman. Any thing further concerning this person, will not be necessary for those who have been in the Levant for the last three years. There arrived at this place last evening six females, who had just escaped from the Arabs. Early this morning they were brought to my quarters. . . . A girl of eleven or twelve years of age stood before me, with her nose cut off, close to her face, and her lips all cut off, so that the gums and jaws were left entirely naked. All this had been done more than a year ago, and the poor creature was yet alive. Her refusal to yield to the embraces of an Arab was the cause of this horrid and shocking barbarity. The pictures here by Bavarian artist Karl Krazeisen were used for the more familiar etchings. The nuances of character which he conveys, and the youth of many of the participants, are lost in the etchings. They are from the collection of the Ethniki Pinakothiki-Mouseio Alexandrou Soutzou of Nauplion. The Condition of Greece in 1827 and 1828; Being an Exposition of the Poverty, Distress, and Misery to Which the Inhabitants Have Been Reduced by the Destruction of Their Towns and Villages, and the Ravages of their Country by a Merciless Turkish Foe can be downloaded from Google books. 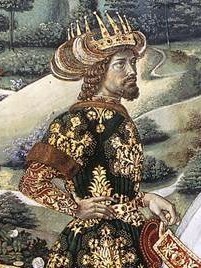 In 1470, after Nicolò da Canale helped lose Negroponte to Mehmed II, Venice replaced him as Captain General of the Fleet with Pietro Mocenigo. In 1474, after a series of military and diplomatic successes along the coast of Asia Minio and Cyprus, Venice elected Mocenigo doge. 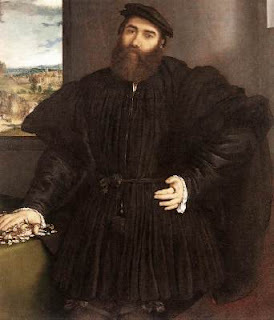 One of the sopracomiti -- ship commanders -- Coriolano Cippico, a Dalmatian in his 50s, wrote an account of these ventures for Marcantonio Morosini, Venetian ambassador to Burgundy,. Burgundy was theoretically an ally of Venice in this war that Pius II had got going -- he called it a crusade against the infidel but he died before the ships sailed -- and this document was most likely intended to encourage Burgundian participation and financing by reassuring them about the Venetian leader. 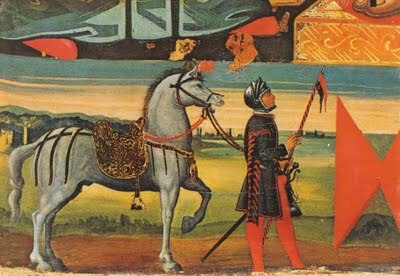 The Venetians, in all the cities of the Morea that are under their dominion, have hired many Albanians on horseback, who are called by the Greek name stratioti. These with their swift raiding have so wasted the part of the Morea that is under the Turks that is is almost a desert and a solitude. These people are by nature intensely rapacious, and more apt to raid than to give battle. They use a shield, sword, and lance; few have breastplates; the others wear a bombazine cuirass as protection against the blows of an enemy. The most valorous of all are those from Nauplion. Mocenigo's tactics were exceptional for that time: he took took the stratioti with the fleet, and not in roundships and towed hulks, but on the war galleys, carrying ten horses on each galley. Depending on how many allies were sailing with him, this allowed him 400 mounted stratioti. Without heavy, slower ships, he was able to attack with exceptional speed, which was increased by his having the fleet sail to its target by night so the attack could begin dawn. Cippico describes that over and over in this account. Mocenigo had certain principles: he would not attack Greek islands held by the Turks, because the residents were Christians, but only sites on the Turkish mainland. 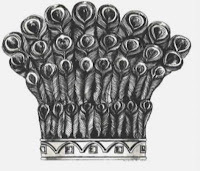 The stratioti brought the General the heads of their dead enemies, to have a ducat each, as the General had promised them: this has always been their custom. The General loaded the galleys with the spoils, and came to a deserted island with good landings, between Chios and the mainland, which is now called Panagia. Here were put all the spoils. Three arbitrators were selected from the sopracomiti, two Venetians and the third a Dalmatian, which is the custom always used in such circumstances. The arbitrators, according to ancient Venetian custom, gave one tenth of all the spoils to the Captain General. (1/10) The stratioti for their part kept two-thirds (6/10), and the arbitrators one-third (3/10). The General had promised them this. All the prisoners were consigned to the arbitrators: these were sold at auction. (It appears from various reports in Cippico that slave dealers followed the fleet.) The money was divided in this way. First, all the soldiers who had brought in an enemy prisoner were given three ducats. 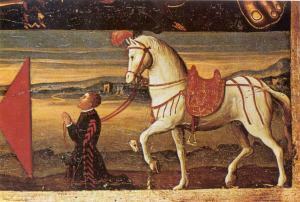 Then, the sopracomiti were paid for the expense of the stratioti's horses. The rest was divided equally among the galleys. The galley of the provveditori was given double what was given to the other galleys. The sopracomiti kept one third, and distributed the rest among the soldiers and oarsmen, according to rank. Samos at present is a deserted island and has always been celebrated for its fertility. Now it is full only of all sorts of animals, an abundance of woodland honey which one can find all around in the forests, and springs of sweet and living water that rise in all parts. The horsemen and soldiers were disembarked to drill and refresh themselves. The soldiers and others went hunting and while they were taking various prey, a youth of the Dalmatian nation and language encountered a bear of marvelous size. The bear avoided his blow, went behind the boy and knocked him to the ground. The boy, without losing spirit, jammed his fingers into both the bear's eyes and held its head so that it would not lacerate him, long enough for another youth of the same nation to kill the bear from behind with a sword. On all sides there was a great killing of animals, and the whole army was employed in the hunt. Several days were spent in festival, with a great deal to eat and drink. More than anyone else, the Schiavoni, of whom there were a great many among the oarsmen, sang drinking songs. After everyone was sated, they boasted about the great deeds they had done, and how they had prospered so successfully against such vile men. More from Cippico in another entry. 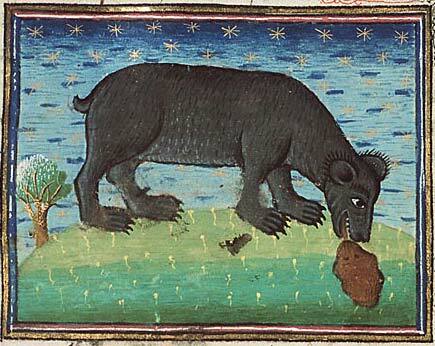 The top image is a detail from a Genoese tapestry of the Battle of Lepanto; the bear is from a medieval bestiary, and is actually licking her cub into shape rather than eating something. 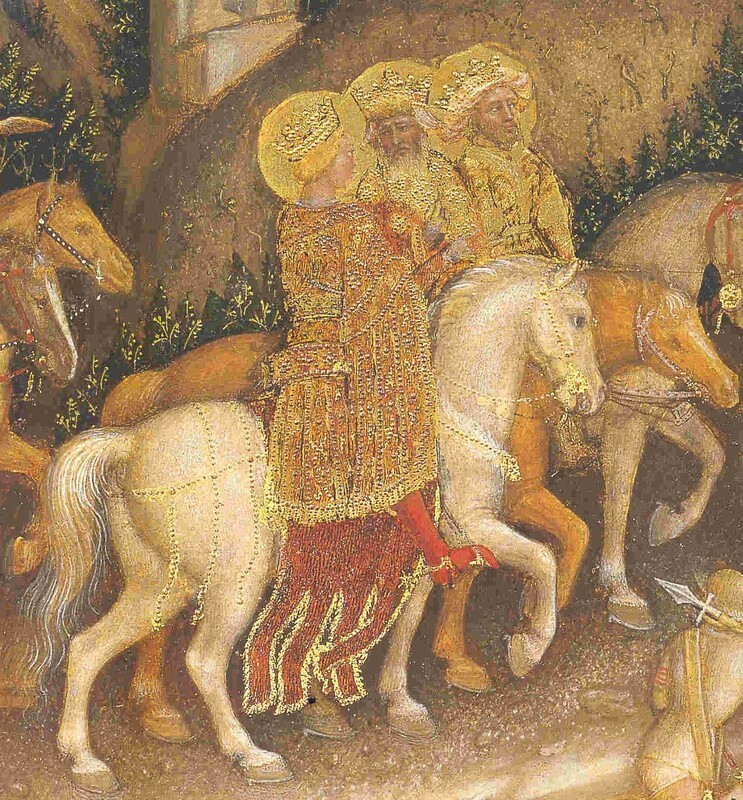 However, Gentile da Fabriano painted his Magi in 1422-23 and the toupha may have been his design. Here the toupha has red and gilded feathers, the Strozzi colors of red and yellow, and this painting was commissioned by Palla Strozzi. There are other elements to notice. The forked beard, for one, which is very common in Western portrayals of John. 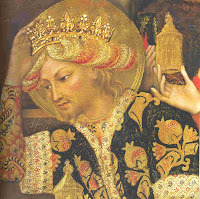 The short-sleeved outer garment, typically Byzantine. 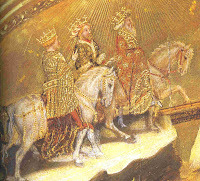 And that this toupha-wearing king is the second king in the line to adore the Infant. John was in Ferrara and Florence in 1438, trying desperately to get help for Constantinople. John was in Venice and Milan in the winter of 1423 and spring of 1424 trying desperately to get help for Constantinople. But: Gentile da Fabriano signed and dated his altarpiece in May 1423. And the beard turns out not to be diagnostic. Other painters of the period have a second king with a forked beard, or a king with the short outer sleeves, though I have not identified any more combinations of forked beards and short sleeves. The forked beard seems to be an attribute of "a king from somewhere exotic." So do the sleeves. 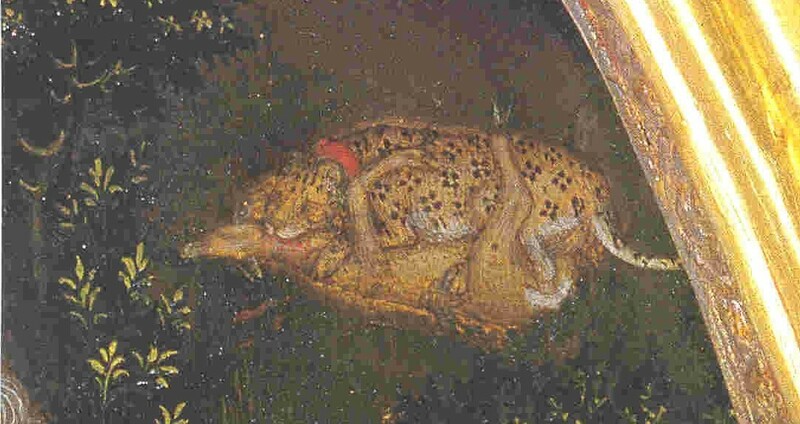 Had Gentile seen pictures of the toufa, such as this from 1340? Or pictures of John? Or pictures of Eastern emperors? Moving on to the animals, Gozzoli gave his magi cheetahs and a lynx. Gentile includes a cheetah and a leopard, on the rumps of their keepers' horses, and hunting. 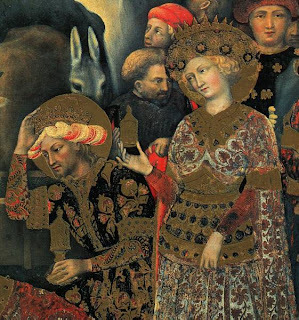 Clearly, Gozzoli drew heavily from Gentile's work and these quotations must have given a great sense of security to his viewers who were looking at a very different style of painting. Surely some art historian has tidily explained this, and the business about the two Second Kings, and some reader can send me the relevant references -- which I have not found although I have looked for them. This is the great pleasure of research: there is always something else out there you haven't seen yet. It is not a matter of "Gotcha!" It is the joy of the exploration that leads from Cyriaco's ridiculous sketch to Gentile's shimmering gold. It is the matter of the journey, riding with the Magi, following the shining track, discovering the unlimited abundance just over the next hill. There are very few pictures of named kapetanioi to be found. I have identified, with help from a friend, a total of five -- all of them painted in Italy in Italian style -- and only one is a real portrait, though one other shows a recognizable face. All five of them, in Italy, considered Nauplion as their home town and that is mostly because of the accident of history that let Methoni and Koroni be taken by the Turks in 1500, and let Nauplion stay Venetian for another 40 years. Ioannis Manessis, son of Comin. Giorgios Manessis, son of Comin. They never dressed that way in Greece. In this icon the Greek-Albanian Manessis men have become Italian soldiers. These three shown here as donors of one icon were all capi of stratioti. Comin may just possibly have been Nicolò or Todoro (d. 1545): the records are confusing. 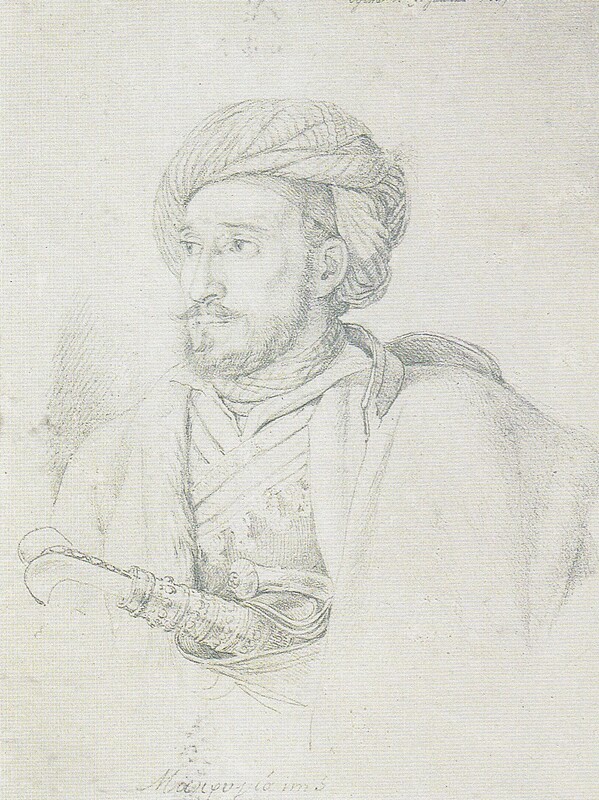 Members of the family were prominent in the Venetian-Ottoman War (1463-1478), and in those years owned land in Mani, in the mountains above Kardamyle. During the war, five Manessis capi whom the Venetian command considered homini da conte had to beg for food for their families because they were near starvation, and men in one of the Manessis villages finally made a private peace with the Turks to avoid starvation. Later they went back to fighting for the Venetians and one of them, Marino, was captured and flayed by the Turks for his treason. The Venetians felt a strong obligation to families who had risked so much for them, and after the war, made sure they had positions as capi and land for their families near Nauplion. 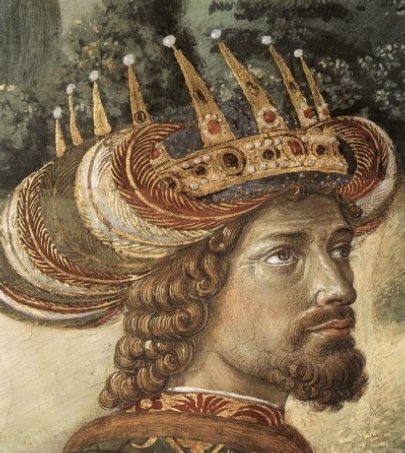 Theodoros Palaiologos, father of the man in this picture, was given a fief with a castle at Thermissi, in Nauplion territory, in 1479 (he was aged about 30) in return for leading troops in the Venetian-Ottoman war of 1464-1478. For the next thirty or so years, Theodoros, and Demetrios in turn, when they weren't off fighting somewhere else, were difficult tenants for the Nauplion administration: they ignored the tax requirements, and used their men for private raids into Turkish territory, and their Greek tenants complained to the Venetians about their violence. After the peace treaty was signed, Theodoros was rehired to lead a small band of horsemen in Friuli. He was made military governor of Zakynthos in 1485, and married Maria Kantakouzene of Corfù in 1486. He fought for Venice in the terrafirma in 1489-95. After that, Venice found Theodoros useful as a spy, an interpreter, and a minor diplomat. His name is remembered in Venice now as one of the men who persuaded the Senato to establish a Greek rite church in Venice. He died in 1532. The position of capi passed from father to son. Demetrios eventually moved to Venice and became a member of the Greek confraternity there. He probably died in 1570, shortly after making his will He identified himself as "da Costantinopoli," probably figuring that with his name, Constantinople would be more advantageous than Nauplion or Zakynthos. Some of the family had escaped from Constantinople in 1453. The picture of Demetrios appears at the end of the Gospel of John in a gospel book of the mid-14th century, made in Constantinople. The text behind his head reads X(ριστο)ῦ τοῦ Θ(εο)ῦ Δημήτριος Παλαιολόγος: the servant of Christ the Lord, Demetrios Palaiologos. The book is now in the National Library of Russia. 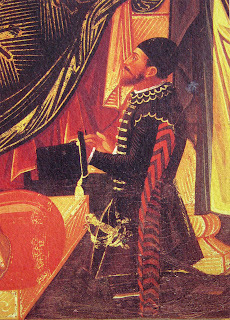 The artist, probably Markos Vathas or a member of his workshop,painted a number of Italian-style images in the book. There are also several imperial-type images added to the book by a Greek-style painter, which Demetrios probably commissioned. Mercurio Bua (1478-1452?) was a son nephew of one of the leading archons and capi of the Morea, Petro Bua, who fought outside the Morea for the Venetians once the peace treaty had been signed. Members of his family led the Bua revolt at Nauplion in December 1480 in support of the Kladas revolt when he was an infant. After Petro Bua died, in 1489, Mercurio (formerly Maurikios) moved to Venice and changed his name to something Italians could manage Although the family had originally moved from Albania to Ioannina to the Morea over several generations, Mercurio identified himself as coming from Nauplion. Sanudo said he was a small man, but this did not seem to affect the regard in which he was held. Beginning with a small band of men, twenty-five or so, he acquired a tremendous record during his career as condottiero, rather than a capo or kapetanios, and eventually was awarded the title of Count of Aquino and Roccasecca from the Holy Roman Empire. He was twice widowed: this portrait shows a small skull and fallen rose petals beside his hand, and is thought to have been painted in commemoration of one of those losses. This painting shows something else. This is not the face of a proud man, which he certainly was, or of a comfortable man, which he had achieved along with the knowledge of a very good and fashionable portrait painter, or of a man who has won an extraordinary number of battles. He poses as a duty. He seems to be bracing his weight with his right hand and leaning against the wall. For years, various people had been commenting that he had gout, and once that he had had to miss a festival because he was in bed with gout. Shortly before this portrait was painted, Sanudo wrote that his body was full of gout. As gout advances it affects not just the feet, but joints over the whole body. The crystal deposits can be felt in many places under the skin and even break through. Bua was in excruciating pain, as well as grief, for this portrait. 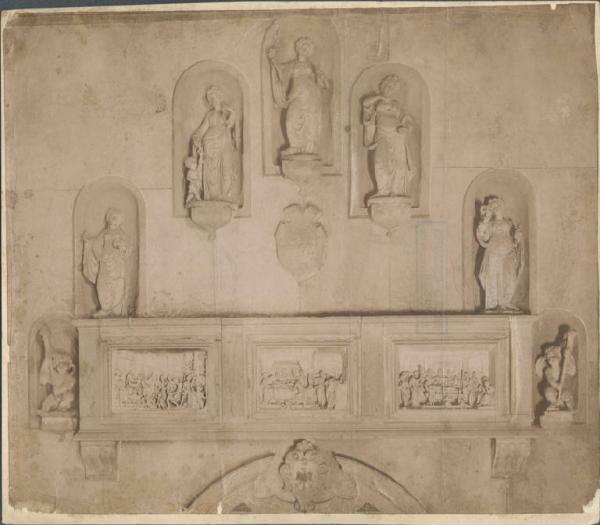 When Mercurio Bua died in Treviso, in 1542, he was given a magnificent tomb in S.ta Maria Maggiore. One of the interesting things in the stories of these men is that four, whom outsiders might identify as Albanian, identified themselves as coming from Nauplion -- originally a Greek city but by 1500 Frankish and then Venetian for nearly 300 years. The fifth man had the name to enable him to claim Constantinople. The modern insistence on nationalism comes from immature egos, and is an advantage only to suppliers of armaments. To insist on these men as Albanians is to completely ignore the culture in which they lived. They spoke and wrote Greek and Venetian, and worshiped as Greek Orthodox. They lived by choice in Venice and the terrafirma. They were professional military, even though sometimes their bands were as small as 15. We have no idea what they would claim for themselves, beyond Nauplion. Venetian documents in the 15th century consider Albanians either  people living in that geographical area; or  migrant herders in the stato da mar territories. Stratioti were military who lived on land assignments, an inheritance from the Byzantine tradition, whether they were Greek or Albanian or of some other origin. Albanians were migratory; they moved about with their flocks and had no fixed address. They may have been soldiers with capi, but they were not identified as stratioti in the documents and when there was no war they paid no attention to Venetian authority. The matter of stability was key for Venetians, and the Venetians saw that Albanian loyalty was first of all to the clan, not to Venice. So one of the things you see with these four men is that, though their families of origin were Albanian, they have become urbanized and ultimately Venetian. My great appreciation to Ersie Burke for her identifications in the Manessis icon, and her information on all of these men. Her book, Coming to Venice, about stato da mar Greeks in Venice, should be out in a year. It will have much more substantive information to offer about all these capi and their families. NOTE: While I have put links here to an Italian site on condottieri , the information should be used with great caution. We have found a considerable number of errors in family names and places of origin.